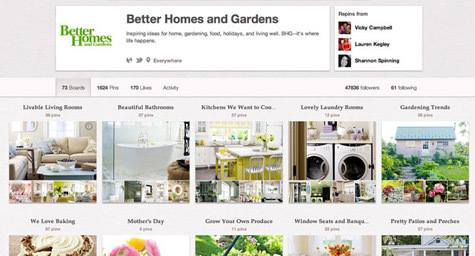 Pinterest is showing digital marketers the vast power of pictures. The visually driven social media site that lets users “pin” images of interest and share them with a rapidly growing online community is capturing the zeitgeist of today’s visual Web. Many of these images promote the products and personalities of brands large and small, which makes Pinterest a desirable digital marketing platform for companies seeking to increase their social media exposure and build a following. The New York Times recently reported on how brands and marketers are racing to develop a presence on Pinterest in order to make an impression on millions of social media users. Pinterest is currently the third-largest social media site behind Facebook and Twitter, but its enormous momentum has industry experts watching the fast-growing site very closely and brands clamoring to get involved. Pinterest is especially popular among the highly coveted female demographic since the most common “pinnable” images relate to home décor, cooking, crafting, and fashion. Women currently account for the majority of Pinterest page views and according to comScore, the site had 18.7 million visitors in March 2012, compared to approximately 400,000 last May. While Pinterest does not have ads, brands can promote themselves through “pinnable” images that serve as direct links to their websites. Numerous companies have started creating multiple “pinboards” that feature images related to their brand. The goal is that Pinterest users will find their pinboards and click on the images to visit the brand’s website, as well as “pin” the images onto their own personal pinboards and share them with others, which increases exposure and community acceptance for a brand. Some marketers have gone so far as to say that pictures are rapidly replacing words in the realm of social media. The sudden rise of Pinterest has many brands experimenting with the best ways to position themselves on a social media site that encourages friendly sharing rather than aggressive promotion. L.L. Bean is one company testing the Pinterest waters by creating a variety of pinboards to determine the best way to engage users. “We didn’t want it to be about selling. We wanted it to be about creating that brand awareness,” said Laurie Brooks, a spokeswoman for L.L. Bean. Marketers are also discovering the power of the “Pin It” button, which is the Pinterest version of the Facebook and Twitter share buttons. This small button placed near digital content enables people to pin specific images, articles, and other content onto their individual pinboards. This tiny button serves as a means of enormous indirect promotion and visual distribution for the associated brands. With Pinterest, users are basically promoting a brand for free by embracing its images, which translates to supporting that brand. This is a digital marketing opportunity that companies can’t afford to miss. To learn how to include Pinterest in your digital marketing strategy, contact MDG Advertising today at 561-338-7797, or visit mdgadvertising.com. Follow us on Pinterest. Check out MDG’s infographic: A Marketer’s Guide to Pinterest and our video The ROI of Social Media.